but if recent years are anything to go by and the fact that Pool is now our number one sport over Snooker in cue sports pastimes . Then it is no surprise work coming in has no high or low spots , we are not experiencing any lull or slack period in work . On the snooker side we have our regular clients and on average visit clubs every year for either a re-stretch of bed cloths or re-covers . our private home clients we average a visit every 5 years , for service re-level , re-stretch work or major work like re-rubber and re-cover or house move and the table goes too . many club’s have extended their pool lounges , and installed more pool tables than snooker tables these days . We do a high volume of pool table maintenance these days . and when it comes to pool tables , the lower cost in cloth and labour per full size mean they have work done in large quantities , and more regular . sometimes all the tables in the room are re-covered in one go . This club used to have all snooker now they just have three , and 7 uk pool , and one Chinese 9 ball table . their is always the exception when it is FREE to play in with your Holiday fee at Butlins . we may see some American pool tables in the future as they look to improve the different venues in Butlins . I am informed they may have plans to turn this American 9 ball hall into a 9 table UK pool hall . and move some of these tables over to the Sports bar / Snooker room part . they say this at Butlins every year for the last 10 years , but the time will come that it will happen . we refurb to this , using larger rubber . and the end result after a re-rubber , see we really know our stuff ! after 42 years personal experience Geoff Large of GCL billiards is one of the best fitters in the country , not that there are a lot of experienced fitters about these days . due to none training up and retirement , the specialist fitters are more hard to find . and it is going to get worse as in 6 years time I may even retire . Below is a few photos of the type of work that we come across . these are typical bad workmanship that I come across . it is pot luck if you get a fitter with high standards and the ethics that have been passed down from fitter to fitter in my history . so please wait for us to become available and book early for work . Today I have been over to Beeston in Nottingham to a club that I have been working on their tables for over 38 years . They relocated to an old building in the town when they built the new Tesco’s around 12 to 14 years ago . Rigidus frame model where the centre legs are closer together and not equal spacing with end legs . Both tables will be re-covered in Strachan 6811 tournament 30 oz cloth . the last time I did them was in 2013 so they have lasted close on 5 years . this club does not get as much use as other club’s , the relocation took them from a prime spot near the high Road to the outskirts of town . and the car park is now very small compared to the old club , where you could park up let the Wife go shopping while you have a frame or two of snooker . you may note all the cue cases on the wall ,Not many club’s do this now . Members have a hook and sometimes a chain they can interlink each case and padlock it to the chain . Many club’s do not like their walls cluttered like this , but this club still has this facility for members to store their cues on the club premises . and today watched it on TV flying over the Mall LIVE ! all the aircraft had took off from RAF Conningsby and where to fly over the Dome tower at RAF Cranwell . I took a few photo’s on my phone of a few planes as they flew over , the first to arrive where the Chinook’s Helicopters . the Helicopter formation arriving from the East over RAF Cranwell Airfield approaching from the East . and as they passed overhead , they made a right racket those twin rotor Chinook’s . a few more Fighter planes going over in formation . another wave of fighter jets . the reason I was at RAF Cranwell was to Re-rubber and re-cover two full size snooker tables and a pool table in the Sgts and Warrent officers mess . one had new nets and leathers fitted . 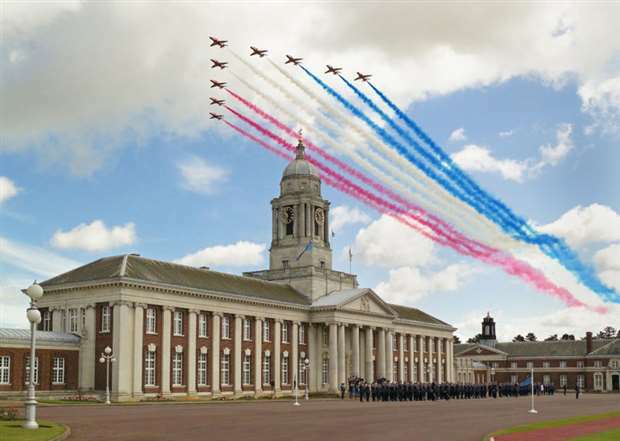 It is not every day that you get to see a 100 plane fly past of aircraft practicing for the fly past down the mall which took place today to celebrate 100 years of the RAF . One for the Billiard fitters travel stories memoirs . Last week working at Butlins , this Week RAF Cranwell . Just spent last week working at Butlins Skegness in the Green Baize club . three complete re-covers , one replacement Bed , 3 sets of nets and leathers and odd nets and ball rails to replace . This week I have two full size snooker tables to re-rubber and re-cover and a 7ft pool table at RAF Cranwell Sgts Mess . they are in a bit of a mess having had low cost rubber bad rebound value fitted last time , and all cloth slips nailed in by a well known local Midlands firm they used last time . I am putting them right fitting top quality Northern Rubber and Strachan Tournament 6811 cloth 30 oz and new nets and leathers . You only get a good table if you use Good materials , so be aware of lower quotes and always ask what rubber and cloth they are using , and look at the goods when they fit it . fitters who tend to use lower grade goods also do a lower grade workmanship , they have no pride or morals , so be aware , you get what you pay for , there is no such thing as low cost quality materials and workmanship . this is an old photo for an example of what to look for , I fitted November 2017 made cushions . also two blue lines embroidered in on one edge . Nets and leathers I use are top quality and supplied by Peradon . all the materials I use are top quality , I cannot barter the price down on quality goods . as proved today when I stripped down the first table in the RAF site . And I am finding by showing the client these things I get repeat work from them . they Know GCL billiards is a firm to trust their cue sports tables with . No corners cut , and no inferior materials used .